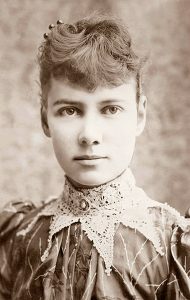 When moxie was being handed out, reporter and writer Nellie Bly got the lion’s share. Known for her journalistic exposés, such as Ten Days in a Madhouse, in which she feigned insanity to get into an asylum, her investigative work led to reforms in the treatment of mentally ill people. She also replicated Jules Verne’s Around the World in Eighty Days voyage, completing it in 72 days, in 1890. You can read more about Nelly Bly and her amazing career in Eighty Days: Nellie Bly and Elizabeth Bisland’s History-Making Race Around the World and Nellie Bly: Daredevil, reporter, feminist. There are Nelly Bly mysteries, too. ← Do you love poetry?